Puttaparthi is where the Lord was born and where He continues to stay for almost the entire year conferring love, support and solace to devotees day in and day out who throng in thousands to this sacred town. 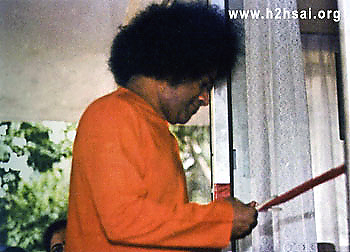 However, when summer arrives every year, the Lord generally decides to move to His ashram in Bangalore or often to His third ashram in Kodai Kanal so that the devotees are saved from the dry and zapping heat of Puttaparthi. For the devotees who now collect in Brindavan or in Kodai Kanal it is the coming of the special ‘Sai Season’ which brings with it so many beautiful blessings. The Kodai sojourn especially is very unique and fascinating, and it is for this reason that Kodai Kanal is often described as the Lord’s playground. 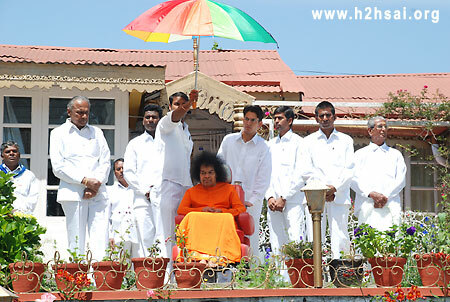 Though Swami has skipped visiting this holy hill station on a few summers, He did visit there in 2009. And we carried the first part of this “Kodai Festival 2009” in July 2009 of H2H. Here is the second episode. The first episode of this series brought you the story of how Swami reached Kodai Kanal from Puttaparthi, which was unique in 2009 as Swami was there in Kodai in a matter of two hours! On that day, April 24, He did give darshan and retired after blessing everyone. This article will now take the series further offering a glimpse of what happened in day two. However, before we get on with the proceedings of day two, maybe we should tell you something about how these Kodai visits actually started. The warden of Swami’s college in Bangalore, Mr. Narasimha Murthy, shared with us this story, so let’s get it from him directly. Bhagavan’s sojourns to Kodai started as far back as 1957 when He was only 31. It began with Mr. Venkatamuni and his wife, Mrs. Shushilamma of Chennai who had connections in Madurai as well as Kodai. In 1957, Bhagavan chose Kodai as His third home. So if you go by the quantum of time He has spent in Kodai, Prasanthi and Brindavan, Kodai comes third in reckoning. 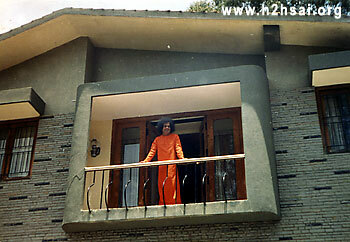 From 1957 to 1966, Swami used to go to Kodai every year and stay there for anywhere between a week to even a month. For some reasons, these summer outings to Kodai stopped abruptly in 1966, and did not resume until 1981. So how did it resume in 1981? Mr. Narasimha Murthy again gives us the answer. In 1978, Mr. Srinivasan had acquired a cottage in Kodai which was called Mount Rest and he renamed it as Sai Krupa. In the April of 1981, after staying in Ooty for 15 days, Swami said that all of them would be returning to Whitefield the following day. Mrs. Vidya, wife of Mr. Srinivasan, along with their children was waiting for Swami at Kodai. Since Swami indicated He would return to Whitefield, Mr. Srinivasan asked his wife to return to Chennai. The following morning Swami said, “We are going to Kodai” and Mr. Srinivasan’s joy knew no bounds! He called up his wife who had actually already rolled back the carpets. Additionally, their son, Murali was running high fever. Swami with an entourage of six people including Mr. V. Srinivasan, Colonel Joga Rao, Dr. Bhagavantham, Mr. C. Sreenivas and Mr. Radhakrishnan reached Kodai the next evening in two cars. On reaching Kodai, Swami told Mrs. Vidya Srinivasan, “Naan Naane vandiriken – I came all by My own!” In order to make Swami’s stay comfortable, the Srinivasans had moved to the servants’ quarters and the servants in turn had moved to the car garage. Swami was very unhappy about this and told them He can’t be comfortable at the cost of their comfort. They begged Swami and He agreed to stay for a few days. Seeing that Swami was extremely concerned about the discomfort caused to the Srinivasan family, Mr. Srinivasan, anxious to ensure that Swami makes more visits to Kodai, requested Bhagavan for permission to build an annexure to the existing cottage. There was plenty of space available, and why not therefore have a special building exclusively reserved for Swami’s use, whenever He came? Swami agreed, and that is how an annexure came to be built. But before we go into that part of the story, which, by the way, is connected to many visits that Swami made after 1981, let us learn directly from Mr. Srinivasan himself about the 1981 visit. This first trip with Swami to Kodai Kanal happened in 1981. And if there was something which one could be certain about Bhagavan, it was His unpredictability. 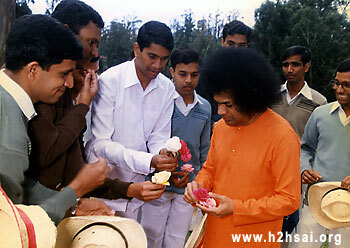 That year, Swami was in Ootacamund (Ooty) and I had gone with Him. My family, meanwhile, had gone to our little house in Kodai Kanal, a dwelling which was about 100 years old, not very ornate, and with limited accommodation. So, I called up my family in Kodai Kanal, telling them, “Look, Swami is in Ooty and I don’t think He will come to Kodai Kanal. It is better that you wind up and come over here to Ooty.” Heeding my words, my family members set off from Kodai Kanal. You can well imagine my plight. In those days, one didn’t have all these kind of elaborate STD (phones), leave alone mobiles. We had to go through the old fashioned ‘trunk’ system and book a call. It was quite an exercise to get through on the telephone. But I finally managed to call my wife to tell her, “Swami is coming tomorrow”. She was incredulous; but that was Swami, springing surprises when one least expects them. The next day, we started off. It took about 8 hours to travel from Ootacamund to Kodai Kanal – driving down to Coimbatore, getting across the plains and the steep climb to the Palani Hills. We were a small group – Dr. Bhagavantam, Col. Joga Rao, C. Sreenivas, and one other person – with Bhagavan. I must emphasize that the house was really an antediluvian specimen with old bedrooms and bathrooms. But Swami spent ten days there with us, just like a family member! In the entire duration of His stay, a tiny gathering of barely 50 people would assemble for bhajans in the evening, which used to take place on the lawn outside. There was no bhajan hall or any such structure. But it was wonderful because Swami’s chair was placed against the Sun and during dusk it was a great sight. When the Sun, which looked fiery red, would set, it used to form an orb around Bhagavan’s hair such that it seemed the beautiful glow radiated actually from His hair. Those darshans of Bhagavan have remained etched in my memory. We had a fireplace, a wood log fire, because it was an old house. Swami used to love to sit near this and at that time, the bhajan singers were just the family members, and we were not all that good. And the doors in the house would also squeak when used. In fact, Swami would mischievously remark, “Not only the people, or the family of Srinivasan sing, even the doors here sing!” That was Swami’s sense of humour! And as we mentioned earlier, in 1981 itself Mr. Srinivasan prayed to Swami for permission to build an annexure to the cottage ‘Sai Krupa’ before the next summer, and Swami gave His consent. In fact, He visited Kodai again in January 1982 for a week and during this visit He even proposed some changes to the construction that was underway. The new building was ready before summer arrived in 1983. And that year Swami’s stay at Kodai extended for little more than a month during April-May. The crowd of devotees increased year after year – all of them eager to bask in the divine darshan of the Lord in the blue mountains. 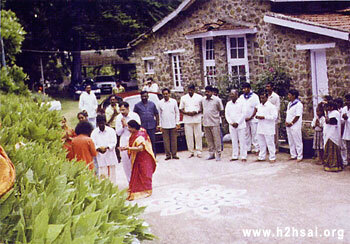 It seems Swami used to be outside most of the time and the devotees would just come in anytime. Also, the evening darshans in Mr. Srinivasan’s house were very memorable. It seems Swami would sit on a chair against the background of the setting Sun. He would also give discourses to the 30-40 people gathered there in Tamil and Mr. Srinivasan would translate it into English. Gradually, the number of people who gathered increased and it reached its peak in 1985 when a thousand people were packed into a small compound. By now, perhaps it became clear to Swami that since the crowds were beginning to increase, He must establish something like an Ashram of His own in Kodai. However, He did not give the slightest indication of what he had in Mind. 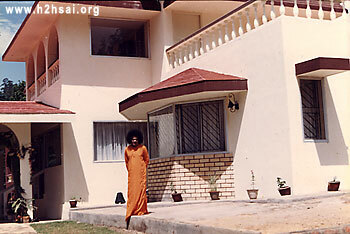 In 1984, when Swami was in Kodai, as usual, He visited the house of many devotees. One of those whom He graced with His presence was Mr. Narasimhachari. Mr. Narasimha Murthy tells us what happened there. In one such visit in 1984 to Mr. Narasimhachari’s house, the latter prayed that he would like to offer a piece of land on the shore of the lake and Bhagavan should accept it. 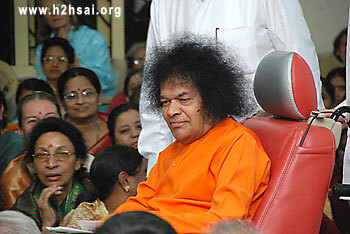 The land was registered in the name of Sri Sathya Sai Central Trust. In 1985 Swami asked Mr. Srinivasan to build a guest house there! It was ready by 1986 May. OK, so Swami wanted a guest house. But why, and for whom? There lies an interesting story! One of the great devotees of Swami at that time was the Rajmata of Nawanagar, wife of the Jamsaheb of Nawanagar. For those who are not aware, Nawanagar was one of the many Princely States in British India, each of which had a Raja or a king; a familiar example of a big Princely State was Mysore, and who has not heard of the Maharaja of Mysore? Nawanagar was one of the many princely states in Saurashtra, which after Independence was acceded to India. As the Queen of a Princely State, the Rajmata [meaning Queen Mother], commanded much respect and authority and after her husband passed away, came to live permanently in Bangalore as those days Swami used to spend a lot of time in Bangalore in His ashram in Brindavan. Her building is in fact tucked in between the Ashram and the college in Brindavan. But as Swami started going to Kodai regularly, the Rajmata too wanted to come there and have Bhagavan’s darshan. Swami is very particular about giving due worldly respect to rank and status, and thus whenever the Rajmata came, He would make sure she was accommodated in a big bungalow; usually, it was the summer residence of now late Mr. Arjun Raja, a prominent businessman of Madras. Mr. Srinivasan was overjoyed that Swami had given him a special assignment and went about it with great gusto. By May 1986, the guest house was ready. Let us now allow Mr. Narasimha Murthy to pick up the story at that point. 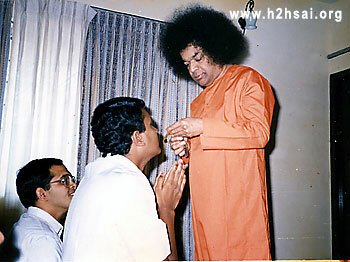 Swami was in Brindavan in the May of 1986 and left for Ooty on 3rd May and returned after ten days of stay. The first batch of research scholars was there in Brindavan and they were very happy to hear about the Ooty trip. Swami had earlier told them that if they complete their Ph.D. in two years, He would take them to Ooty and Kodai. They were working hard in anticipation of Kodai trip even in hot summer! 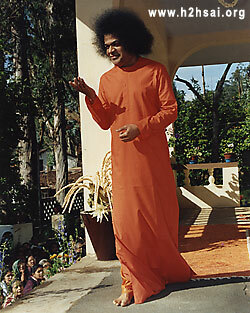 After returning from Ooty, Swami went to Puttaparthi one morning in May when it was very hot. And that day, He called about 23 research scholars for an interview and asked who among them was allergic to cold. Four boys threw their hands up. Swami materialized vibhuti for them and then revealed that all except them were going to Kodai and returned to Brindavan. It was as if He went there only to tell this! Days passed and the institute re-opened in June. Boys thought it was just a leela and the Kodai trip was possibly now a closed chapter. Swami had played one of His enticing games; He held out a great prize and then suddenly appeared to forget all about it. And then He sprang a surprise, and this was one uncertainty that the lucky boys who benefitted loved immensely. And what was that surprise? Let us hear about it from the Warden of course. Remember, the year was 1986. 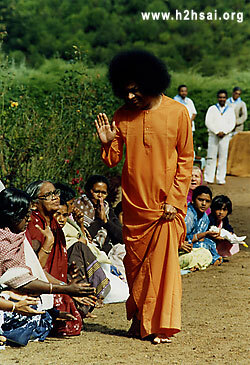 On June 16, Swami sent word that the boys chosen should go to Brindavan with the luggage required for Kodai trip. The Sri Sathya Sai Central Trust had just bought a bus. I was the Warden then. I remember how the boys danced in joy! The bus left Puttaparthi at 3 p.m. and reached Brindavan by evening. It was drizzling and cold. Swami had made all arrangements for their stay and had retired by then. Next morning, Swami called the boys to assemble in the jhoola (swing) hall in Trayee Brindavan and He himself described to them about Kodai Kanal and told them about all the important places to visit at Kodai like Pillar Rocks, Silver Cascade, and so on. He was bubbling with enthusiasm and one could well imagine how much happiness that would have given to those lucky boys. Just then a volunteer entered and said, “Swami, it seems there is heavy rain in Kodai Kanal and the forecast says it will continue for the next 15 days”. The boys started to feel that the trip will be cancelled when Swami said, “We will start tomorrow as planned; everything will be fine”. On June 17, the rain stopped. The next day Swami went to Kodai Kanal and there was no rain for the five successive days. In the morning of June 18, the convoy started its journey with Swami in a car followed by a few other cars and a bus in which the boys travelled. 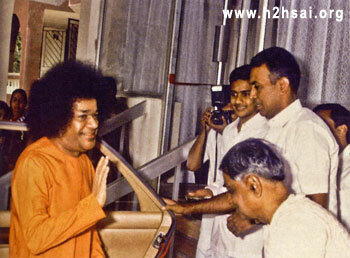 Swami reached Sai Krupa, Mr. V. Srinivasan’s house, at about 6:30 in the evening. The boys were delayed because the windshield of the bus broke while travelling to Palani and they had to stop for repairs. Swami was awake till 9:30 p.m. waiting for these boys. He even sent two cars, one towards Palani and the other towards Madurai. The boys finally reached at 9:30 and were housed in a hotel close to Mr. V. Srinivasan’s home. After dinner, Swami told Mr. V. Srinivasan that He would be moving to the Rajmatha’s guest house nearby. It was of course a total surprise and needless to say also a shock for Mr. and Mrs. Srinivasan, but they took it all in the right spirit, confident in the feeling that even if Swami did not physically stay in their house, He was always in their heart. Next day, the boys were all asked to assemble in the new house just below the residence or Mr. Narasimhachari, and later Swami arrived there. 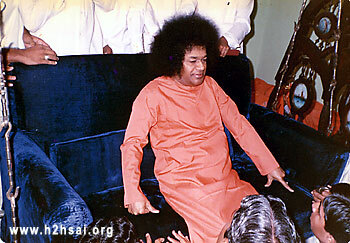 After all were seated, Swami began asking those present what name should be given to this new residence of Bhagavan. For those who know, this is an old routine; Swami would ask for suggestions and then pick a name that no one had come up with; and that would be the best choice, always! So it was this time too. Names were thrown up and Swami kept moving His head as if to say, ‘not quite OK’. He then stopped this naming game and asked the boys to do some Veda chanting. 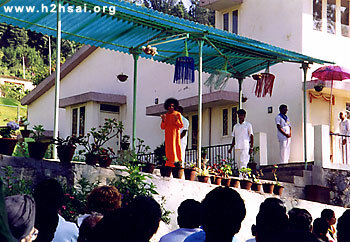 After a while He asked the boys to stop and said, “This Ashram would be known as Sai Sruthi. Sruthi means the Vedas, and the name indicates that the Vedas live here!” It was gentle and not so subtle reminder that in fact, He personified the Vedas! Coming now from the background story to what actually happened on day 2 in April 2009, well, as usual, all the boys got ready quickly, waiting for Swami to appear. 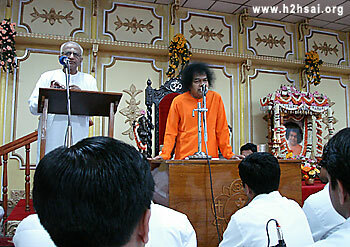 When Swami came out, He was enthusiastically informed that a very expectant and sizeable crowd had gathered outside. After checking with the boys whether they had slept well, and had eaten breakfast, Swami gave the signal for commencing darshan. And now let us get into that mood by listening to some of the bhajans sung during that day’s darshan. 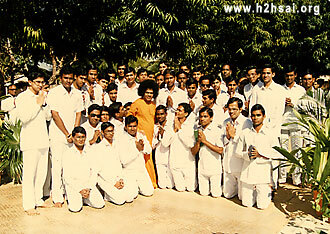 As narrated by Mr. Narasimha Murthy earlier, Swami started taking students with Him from 1986. From then, there have been many Kodai trips, though not every year. 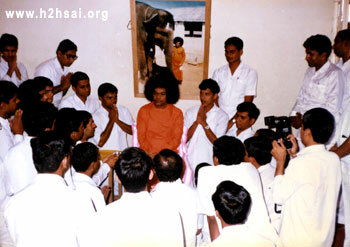 And on every occasion, Swami took students with Him. The first article of this series gave you an idea of the student selection for the 2009 trip, but in general, how did Swami choose whom to take in earlier years? Was it by some kind of lottery or was there some other scheme? We will of course never know all the details, but Prof. Anil Kumar once gave us some insight into this Divine selection procedure. Here is a brief excerpt from an interview recorded many years ago by Prof. Venkataraman with Prof. Anil Kumar. Swami selects students for the trip, and the selection is based on all aspects of their performance in the college - academic, conduct, devotion, excellence in sports and games, talent in singing and dramatics, and so on. 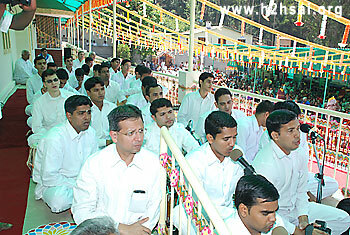 Many talented students who are also highly devoted are selected by Bhagavan to follow Him. A few teachers are also included in the party. GV: Typically, how many hours a day does Swami spend with the boys? AK: Immediately after breakfast He spends an hour with them. After that, Bhagavan goes out to give darshan to the devotees and grants them interviews. During this time, the boys go around the lake a bit and return by 9:30 a.m. From 9:30 to 11 Swami again talks to the boys, after which lunch follows. Next we have tea around 2 p.m.
Swami talks to boys again from 2:30 to 4 p.m. From about 4 to 5 p.m. there is a public meeting which the boys also attend. After this, Swami again talks to students and some select devotees, which is something like an ‘echo session’ as the evening meeting is reviewed. GV: Public meeting means discourse also? AK: Yes of course; the Discourse is given in the Bhajan Hall of Sai Sruthi. GV: So, from morning till evening, Swami is talking all the time? AK: At least five discourses a day! AK: Four of these discourses are exclusively for students. Besides, it is wonderful to see how Swami treats the boys. He enquires about their family, their brothers and so on. That was then; things of course have changed with time, since it is no longer possible for Swami to subject His body to that heavy strain. The number of sessions has decreased, but the quality and the depth of the intimacy has not changed a bit. Often in the current times, Swami likes to hear students sing for Him. In particular, He would ask for certain songs to be sung, correct them as they are rendered, and then comment on the song, and so on. 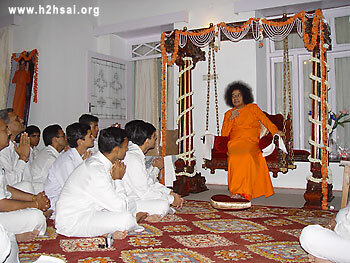 Very quickly, Swami would start planning a programme for presentation to the public, and thus it was that during the Bhajan session on the second day itself in April 2009, Swami asked students to sing not merely bhajans but also some of His favourite songs. Here is a selection from that musical evening session. The arathi concluded the events on the second day. The next episode will offer you the proceedings of day three of this special Kodai 2009 trip. What are your impressions about this article? Would you like more such stories about exemplary personalities serving in various Sai missions? Please share your feedback by writing to [email protected] Do not forget to mention your name and country.